Welcome to our Community Pages. Here you will find News articles and various community publishings spotlighting the School of Medium Arts and Predictive Sciences. Not unique » Tarot reader believes everyone can see into the spirit realm. 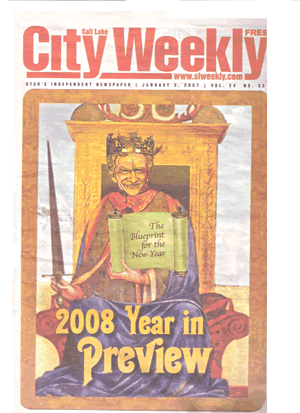 2009 was met with uncertainty and anxiety for many in our communities and nation. With the instability in the economy and the new president about to take the reigns, two women in Murray believe they have the ability to predict what the future holds ~ for a price. 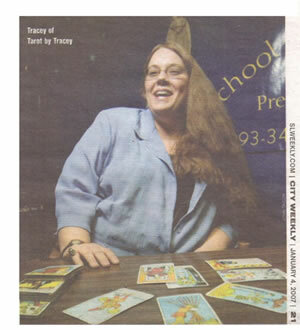 Tracey, of Tarot by Tracey considers herself a predictive science expert. She uses a variety of ancient tools, including tarot, Nordic runes, Chinese I Ching and even dice, to predict the future for people. She considers herself a clairvoyant and said she can see the spirit realm. She also teaches classes in the art. She does not consider her gift unique. "You can learn it all," Tracey said. "Everyone has it all. Men like to call it listening to their gut. Women call it intuition." Tracey said that with the tarot card readings, a question or prayer is asked, and the tarot is the translation tool used to answer those prayers from a higher source. Tracey also has a theology license and had her own church for 214 years. She continues to have prayer and Bible study out of her offices. She has been practicing for 15 years as a psychic. "There are charlatans in every field, but what gives us the bad name is religious control," Tracey said. "People want help. They want God without jumping through hoops at church." Tracey has seven students in her School of Medium Arts and Predictive Sciences. A former student, Shawn Harman, said he believes "whole-heartedly" in the predictive sciences and that Tracey was "right on the money" when she read his cards for him. "She's really good," Harmas said. "She's read for me three times, and each time was accurate." Jeri Sheya has been reading tarot cards for more than 50 years. She practices in her home and said although her business is in Murray, she gets majority of her calls from clients across the nation - or even international clients. Sheya said she reads for the past, present and possible future. "I say 'possible' because we all have power over our own lives," Sheya said. Sheya said her clients give her good feedback on their readings, claiming they have 100 percent accuracy. "I would say the most accurate I could be is 80 percent, because I don't think the universe gives us that much power," Sheya said. Sheya charges $40 for 30 minutes and $75 for an hour-long reading. 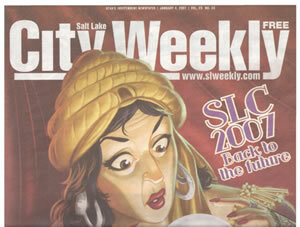 She can do appointments in person or over the phone at 801-694-3901. "A lot of people are asking about jobs and the future," Sheya said. "I don't do lotteries. I don't use my gift for money. I don't think it's right." Where to go: The school at 4070 S. 65 West in Murray. Tracey's Web site is Www.tarotbytracey.com. OTHER ARTICLES: Please note that these articles have been scanned in PDF format, you will need to download Adobe Acrobat Reader.